The concept of a PLN has been around for a very long time. PLN's back in the day consisted of individuals with the same professional interests engaging in mostly face to face communication. Fast forward a good amount of years and enter the internet. No one can argue that the evolution of the real-time web has dramatically altered how we communicate, gather information, and reflect. The construction of a PLN enables educators to harness the power inherent in 21st Century technologies in order to create a professional growth tool that is accessible whenever wherever. In particular, my PLN provides me with a constant supply of resources, thought-provoking discussions, knowledge, leadership strategies, and ways to successfully integrate technology. Twitter: Microblogging platform that allows educators from all corners of the globe to communicate in 140 characters or less. Allows for the sharing of resources, discussion of best practices, and collaboration. For more information on Twitter check out this video. LinkedIn: Professional networking site that allows educators to connect, exchange ideas, and find opportunities. Educators can join a variety of groups that cater to their individual learning interests and engage in discussions as well as submit, read, and comment on articles. For more information on LinkedIn check out this video. Blogs: Incredible sources of information that allow educators to reflect, share opinions, and discuss various topics. This is a common medium to discover best practices, examples of innovation, and learn from professional experiences of both novice and veteran educators. Common blogging applications include Blogger, Wordpress, and Medium. For more information on blogs check out this video. RSS Readers: RSS stands for "Real Simple Syndication". An RSS reader is a tool that allows you to keep up with educational blogs, news, wikis, and podcasts all in one convenient location. By subscribing to various RSS feeds educators then have a customized flow of information that is continually updated and accessible through the use of mobile devices or the internet. Educators can even create their own RSS feeds! Popular RSS readers include Feedly and RSSOwl. For more information on RSS check out this video. Tablet apps are great tools to access RSS feeds and create your own customized news feeds. Flipboard is the best app that can be found on iOS and Android. Wikis: Collaborative websites that allow registered users the ability to create and edit any number of interlinked web pages. Wikis encourage information sharing and collaborative learning. Educators can view and join some exemplary wiki models at Educational Wikis and Wikis in Education. For more information on wikis check out this video. Digital Discussion Forums: Consist of communities of educators interested in similar topics. One of the most popular sites is called Ning where educators can create or join specific communities. Ning sites offer a range of learning and growth options such as discussion forums, event postings, messaging, news articles, chat features, groups, and videos. Popular educational Ning sites include The Educator’s PLN, Classroom 2.0, English Companion Ning, and Ning in Education. Other fantastic digital discussion forums are ASCD Edge (you must be a member of ASCD to join) and edWeb.net. Social Bookmarking: Method for storing, organizing, and sharing bookmarks online. Diigo allows you to add descriptions as well as categorize each site using tags. Educators can even join groups and receive email updates when new bookmarks are added. For more information on social bookmarking check out this video. Facebook: Social networking site that not only allows people to keep up with family and friends but also to connect and engage with professionals. The Facebook in Education page provides information on how educators can best use Facebook as a resource. Other groups worth following in order to strengthen a PLN include Edutopia and #EdChat. Each customizable page or group provides a variety of learning opportunities and growth options for educators. Pinterest: Everyone these days seems to be pinning. This tool is a great way to curate information to satisfy even the most finicky of learning needs. Check out my board just on PLN's. Voxer: A simple to use push to talk app that can function like a walkie-talkie. With Voxer educations can engage in both synchronous and asynchronous conversations about professional practice. Learn more about how Voxer can enhance your PLN. For more information on PLN's check out this fantastic video! Share this post and help a colleague develop their PLN today! This is good stuff. The more resources we provide to take some of the bite out of building a PLN, the more teachers we will see jumping in. I have a newbie guide to start a PLN on my blog too. Great job. Classroom 2.0 has over 45,00 educators.. Even my Ning (Making Curriculum Pop) has over 3,000 educators in the mix. Well organized Ning are a wonderful PLN addition that should not be overlooked! Congratulations! I look forward to sharing it with teachers and schools as PLN's are an essential (and often misunderstood) aspect of teaching and learning today. I will add the links and the videos to my must share resources! Thanks! I like this overview and I will share it with my network. 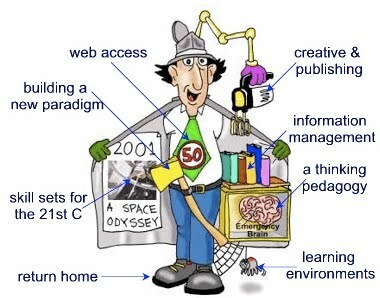 I have found all of the tools you mention to be helpful in establishing my own PLN and deepening my professional knowledge. Another important aspect of my network is listening to podcasts that focus on edtech. Two that I have found most useful recently are Moving at the Speed of Creativity by Wes Fryer and the Tech Chicks Podcast. Fantastic stuff Eric. I will share your post with our higher up administrators. Keep up the good work. I shared with two individuals trying to make sense of PLN. Also included in my Diigo Library. Thanks! Great info put very simple. All teachers should have this list given to them and be forced to use it and teach it. It wont be long before all the kids know what these things mean and we better make sure the teachers do also. Thanks for the info! Great roundup of resources! I have shared with several teachers in our district! Thanks for providing this explanation. I'll use the format you've presented above with groups of administrators who need a kick start! You clearly stated a great number of sources for educators to use to develop a PLN and they are all great sources. What you have probably done however, is overwhelmed anyone new to Social Media. It is this information overload which drives people away from technology, screaming, and flailing. I am convinced PLN's need to be developed over time. As people learn about one Social Media source it will be time to move onto another as needed. If we, as users of Social Media, look at our own PLN development we look at the success we have now, and forget how long it took us to get it together. I am an ardent PLN supporter, but I am not convinced that there is a quick route to success. There is no right or wrong way to create a PLN. The key is to pick one or two of the resources listed above and begin to cultivate a vibrant learning network based on ones' needs and interests. I feel it is important to list a variety of options and starting points for the main reason being that a tool that works for someone might not for another. As you eloquently stated, as a person learns about one source and has success with it then the time might be right to try something else (this is exactly what I did). Quick route to succes? Not by any means. Quick read to know what options are available and how they fit in to a PLN? Yes! Thanks for your comment! I love all of these posts about building and expanding our pln's, but my biggest issue is: how do you find time to keep up with everything and everyone?! I think I need a class on how to keep up with my PLN! At last! I found a good post like this.. Thanks for this informative post! By the way, can you write a post about linkedin seo factors? Thanks again! I am offering a technology boot camp next month which will surely include his information. Great post! Thanks for sharing. I will pass on to other educators!